This is Part V of a five-part, weeklong series about how and why to write a press release. Click here for other installments. This evening (August 7, 2009 @ 10 p.m. EST), one winner will be drawn to receive a special package from Market Mommy, including a press release, business card design and button ad design. The package is valued at $75! Please read the fine print at the end of the post for details on how to enter. You can register up to six times each day!! So now that you’ve written a killer press release, how do you get it read by the right people? Your distribution list is almost as critical as the release itself. You must determine the editors and the publications that would be most interested in your release and send it to them. In addition to your traditional newspapers, radio stations and television stations, there are also a multitude of websites, blogs and trade publications that may be very interested in what you have to say. So, how do you find them? If you have the budget, you can pay to have your releases distributed. Sites like PRWeb can distribute your release to thousands in your targeted audience. However, most mom business owners are on a very limited marketing budget. Believe it or not, you can distribute your releases yourself. First, include all of your business contacts. They may have a newsletter or blog that they may want to include your news in. Plus, it is always good to keep your affiliates and business partners informed of what your company is doing. Next, include your local and regional media. Who in your area might be interested in what you have to offer? Contacts for your local media can easily be found on the internet. For regional and statewide media, there are directories that can be purchased like this one. However, this can get costly especially in a market where turnover can cause contacts to change frequently. It is time consuming, but scouring the internet can be very effective. Search for trade publications that relate to your field. Search for blogs that specialize in your type of products or services. Look for news outlets that publish news on entrepreneurs and new products. Networking with similar businesses is also a great way to increase your media contacts. There are a few outlets that still prefer a mailed or faxed press release, however e-mailed press releases are now becoming the norm. By using the internet to do your search, you will likely be able to easily ocme up with e-mail addresses of contacts. After distributing your release , you should always post in on your company website. Having a good news section can go a long way in boosting your SEO. Plus, it is a great way for new customers or affiliates to catch up on the history of your company. Thanks for visiting us for Press Release Week! I hope you’ve learned a thing or two and will be able to put it to good use for the benefit of your company. As always, if you have questions or need a little help, don’t hesitate to contact me. And, stay tuned! At 10 p.m. we’ll announce the winner of the marketing package! 1. Leave a comment on this post, any comment. 2. Join the Market Mommy mailing list (box to the right of this post) or comment and tell me you’re on the list. 3. Follow this blog or comment and tell me you are already a follower. 4. Become a Fan of Market Mommy on Facebook or comment and tell me you’re already a fan. 5. Follow Market Mommy on Twitter and Tweet about this giveaway, if you’re already a follower, just tweet. 6. Blog about this giveaway or grab our button ... you must link back to either this blog or Market Mommy's official site. This is Part IV of a five-part, weeklong series about how and why to write a press release. Click here for other installments. Come back tomorrow when we discuss how to create a distribution list you’re your release. Friday evening (August 7, 2009) one winner will be drawn to receive a special package from Market Mommy, including a press release, business card design and button ad design. The package is valued at $75! Please read the fine print at the end of the post for details on how to enter. You can register up to six times each day!! As a journalism minor, the Associated Press Stylebook was something I was introduced to the first semester of my freshman year of college and I’ve had my trusty copy ever since. The book is like any other stylebook, in that it lays out the rules of a particular style of writing, in this case journalistic writing. The AP strives to keep its writing style concise and easy to read. This stylebook clarifies their rules on grammar, spelling, punctuation and usage. Without going to extremes, I believe it is a good idea to follow AP style when writing a press release. It is the format that most journalists adhere to so why not make your release ‘publish ready’ and limit the editor’s need to edit? I’m going to walk through some of what I feel are the basic essentials, but this is by no means a comprehensive list. If you are interested, the book can be purchased here, and is definitely affordable. Abbreviations/Acronyms:: There is quite a bit of information about abbreviations contained in the stylebook. There are rules for abbreviating states, titles, addresses and more. However, it is best to avoid excessive abbreviating. Do not use abbreviations or acronyms that a reader would not easily recognize. Contractions:: Contractions indicate informal writing and excessive use of them should be limited. It is best to spell them out instead. However, contractions that are listed in Webster’s New World Dictionary are technically acceptable. Datelines:: A dateline, found at the beginning of a press release or news story, should include a city (in all capital letters) followed by the state, country or territory the city is located in. There should be a comma in between the city and state and there should be a dash following the state. There are cities that stand alone without a state and there are rules for abbreviating the states. All of which can be found in the stylebook. Numerals:: Numerals zero through nine should be spelled out and numerals 10 and over should be written as numbers. All numbers over 1,000 should include a comma. If a number begins a sentence, it should be spelled out, if the sentence can’t be restructured. There are several entries in the AP Stylebook pertaining to the use of numerals. Punctuation:: In the AP Stylebook, there is an entire chapter dedicated to punctuation. I will just note some key points. Commas should always be placed inside quotation marks. A colon introduces a list and a semicolon separates thoughts. Exclamation points and parentheses should not be used often. Quotations:: When quoting someone in your press release, never alter the quotation. Always use it verbatim. Also, try to avoid fragmented quotes. If a quotation is long and cumbersome you may try to paraphrase it. States:: The AP uses different state abbreviations than the United States Postal Service. This is one of the most common reasons for me to pick up my stylebook. Some shorter state names, like Iowa or Ohio, are never abbreviated in AP Style. The first letter is capitalized and there is a period at the end of the abbreviation. For example, Florida is abbreviated Fla. and Tennessee is abbreviated Tenn. They stylebook gives a comprehensive list of the AP state abbreviations and the ZIP code abbreviations as well. As I mentioned, there is a lot of information contained in the AP Stylebook and without dedicated studying there is no way to memorize it all. However, it is an excellent reference and can improve your writing for the media. Especially when there is the possibility of a media outlet publishing your release without further investigation, it is nice for it to already be formatted in AP Style for the editor. Now that you have a factual, concise, grammatically correct press release written we need to discuss distribution. Tomorrow, we’ll discuss creating your distribution list and getting your press release seen by the masses. This is Part III of a five-part, weeklong series about how and why to write a press release. Click here for other installments. Come back tomorrow when we discuss the AP Stylebook. Friday evening (August 7, 2009) one winner will be drawn to receive a special package from Market Mommy, including a press release, business card design and button ad design. The package is valued at $75! Please read the fine print at the end of the post for details on how to enter. You can register up to six times each day!! As mentioned earlier in the week, it is best to keep your release short and to the point. Usually one page is more than enough space. In that limited space, however, you need to make sure you answer the 5 Ws:: Who, What, When, Where and Why. This is the basic concept for journalism writing and will help ensure that you are telling the full story. The 5 Ws usually also include one H, How. Ideally, each of these questions will be answered in the lead paragraph. Sometimes, however, the body of the release is needed to answer the how or why. When writing your release, make sure each of these questions is answered so that you give your contacts the entire picture. Most of this is self-explanatory, but we will visit it in a little more detail. Who:: The who is usually you. Whenever you are writing a press release about your business, you (the owner) or the business name answers the who question in most cases. This just serves as a reminder to mention your business name in the opening sentence of your release. What:: What happened or what is going to happen? What could be a new location or a new season’s line. The what could also be your website or your event. When:: When is easy. It is the date of your launch, your opening or your event. It is whenever the what is happening. Depending on your topic and the timing, the when could be past, present or future. Where:: Where is also usually easy to answer. It is where the what is happening. It can be a physical location, a web address or even an entire country, i.e. if your company is expanding into Canada, for example. How:: How can also be a little more difficult to answer, or at least take some more explaining. How are you accomplishing your goal? How did you open your new location? Always focus on your hard work and dedication to customers . All these are critical pieces to your release. As you can see, the 5 Ws can be used as a proofing mechanism. Before distributing your release, go through them one more time to ensure you haven’t missed anything. Tomorrow we will talk about the Associated Press Stylebook and its importance when writing press releases. Have a great Wednesday! This is Part II of a five-part, weeklong series about how and why to write a press release. Click here for other installments. Come back tomorrow when we discuss the 5 Ws. Friday evening (August 7, 2009) one winner will be drawn to receive a special package from Market Mommy, including a press release, business card design and button ad design. The package is valued at $75! Please read the fine print at the end of the post for details on how to enter. You can register up to six times each day!! If you want your release to be taken seriously it needs to be correctly formatted, plain and simple. An editor can take one glance at a release and by that first impression decide whether to even read your release, much less publish it. There are a few other acceptable variations to this format, but I am going to walk you through the format that I use and that has been successful for me. 1. Logo:: If you are sending out a hard copy press release, either by mail or fax, this is probably going to take care of itself. Logos are usually found on letterhead and other office stationary. However, if you are sending out an electronic release, which is now the norm, you will need to make sure that your logo and business identity are clearly recognized. It all goes back to basic branding! 2. Date:: You definitely want editors to know when the release was sent out. This keeps them reassured that the information is timely and gives them a reference if they ever do any type of historical piece in the future. 3. For immediate release:: In some very rare instances press releases are distributed before they are to be made public. In other words, they are sent out as a sneak peek or heads up to editors. This doesn’t happen very often, but it is still common courtesy to let your contacts know the information is fair game, immediately. 4. Headline:: A strong, attention-grabbing headline is crucial. It should be direct, descriptive and one line or less. A headline can make or break your release. A factual headline will get you much further than a fluffy one. 5. Subhead:: In some instances it is necessary to provide additional information to your one-line headline. 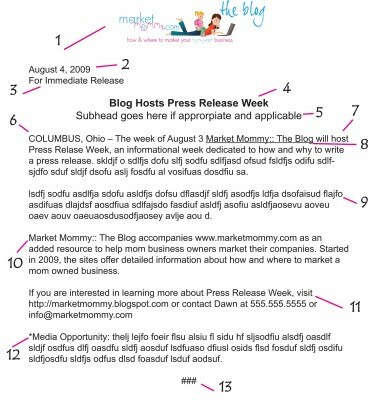 For instance, when I launched Market Mommy I included a subhead because I felt I needed to further explain the new concept of the site. Use your best judgment, a subhead can be helpful in clarifying a headline. 6. Dateline:: This tells the media where the release is originating from, or where your company is physically located. This is very important for regional publications or if you are announcing an event. It should be formatted as shown. The city should be placed in all capital letters followed by a comma and the state name. There is more information about datelines in the Associated Press Stylebook, which we will talk more about on Thursday. 7. Lead:: Aside from your headline, the next most important line in your release is your first sentence, or lead. It should be packed with facts, answer most, if not all, of the who, what, when, where and why, and leave your reader wanting to read more. 8. Link:: If you are sending out an electronic release, it will save your contacts an extra step by including a link within the text of your release. Launching a new online store? Link to it. Launching a new line? Link to that line. 9. Body:: This is where the meat of your information goes. Give your essential details here. If you can include a quote, maybe from a satisfied customer or the business owner, place it here. 10. Boilerplate Statement:: Every company should have a general boilerplate statement that describes the company. A few sentences that summarize the company’s history and offerings can go along way if you use it consistently. 11. Contact Info:: It doesn’t matter how you decide to format your press release, it is CRITICAL that you include your contact information. Editors work on short deadlines, if they want to contact you and follow up on your release they will want to do it quickly. If they do not have your contact information, they will not seek it out, rather they will toss your release aside. If there is no contact information it is a quick sign of incompetency. 12. Photo caption/Media opportunity:: If you have additional information to provide, i.e. a photo caption or details about setting up an interview, it should go at the end of your release. I typically use asterisks to let the reader know it stands apart from the body of the release. 13. ###:: Always let the reader know they have reached the end of your release by placing three pound signs at the bottom. As you can see, a lot goes into writing a press release. But, if you take your time and go step by step, you can write a great, attention grabbing release! Be sure to stop by tomorrow when we’ll visit the 5 Ws. This is Part I of a five-part, weeklong series about how and why to write a press release. Click here for other installments. Be sure to visit tomorrow when we discuss how to format your release. Friday evening (August 7, 2009) one winner will be drawn to receive a special package from Market Mommy, including a press release, business card design and button ad design. The package is valued at $75! Please read the fine print at the end of the post for details on how to enter. You can register up to six times each day!! As all of us mom business owners know, advertising dollars are hard to come by. This is why Market Mommy is dedicating an entire week to press releases. As insignificant as they may seem, press releases have the potential to grow your business and catapult it in front of thousands, all for FREE. Press Release:: A written public relations announcement distributed to the news media as a way to inform the public about company developments; also sometimes referred to as a media release or news release. First and foremost, a press release must be used to disseminate information about something that is actually newsworthy. For instance; a grand opening, a new line, an event, a name change are all newsworthy items as they relate to your business. Be sure to latch on to what is unique about your story and highlight it in order to set yourself apart. The ultimate goal of your release is to garner media attention. Typically, journalists use a press release as a base for a larger story. However, in some smaller markets especially, press releases may be ran as written; all the more reason why your release should be written with care. In news print, especially, space is limited. So, keep the critical information in your release toward the top so when cuts need to be made, editors can easily remove the ‘extra’ from the bottom. And, always, always pay close attention to grammar and punctuation. Remember, your press release is written about a news item, not as a sales pitch. Keep your tone neutral and objective and write in third person. Avoid clichés and try to focus on what is new and unique about your news item. A well written press release is much more likely to be chosen by an editor for publication than a poorly written one full of errors and unrelated information. So, now you are probably thinking that you need to write a press release, but how do you begin? Check back tomorrow when we discuss formatting your release. And, don’t forget to comment here for your chance to win $75 worth of marketing services from Market Mommy! 2. Join the Market Mommy mailing list (box to the right of this post) or comment and tell me you’re on the list.3. Follow this blog or comment and tell me you are already a follower.4. Become a Fan of Market Mommy on Facebook or comment and tell me you’re already a fan. 6. Blog about this giveaway ... you must link back to either this blog or Market Mommy's official site.